A turn-based combat RPG where you break the rules to win. Dodge enemies and counter them while it is not your turn. Fight a huge assortment of unique bosses, upgrade your party and learn new abilities, on your journey to defeat a chaotic band of hackers. -The game plays out as a turn-based combat-focused RPG. -The battle system rewards both strategic play and timing skill. -Perform series of button sequences to boost your attacks and deal more damage. -Use a multi-directional dodge system to avoid damage from enemies and counterattack in return. Watch enemy behaviors closely in order to dodge efficiently. -Position plays an important role. Enemies take formations in rows and columns, and affect surrounding enemies based on their positions. -Learn new moves for your party as the game progresses, and be able to upgrade their power at the cost of making them less energy efficient and intensifying their button sequences. -Various spins on the RPG formula to minimize grinding. Items are consumables that recharge between levels, you obtain experience points for upgrades from defeating bosses, and clearing non-boss levels unlocks new items and abilities instead of experience points. -Tons of boss battles (17 in total), each with their own personalities and tactics. -Linear level progression, and levels are mainly cutscenes and combat. Exploration isn't a focus for this game. -More to come as we make more progress. 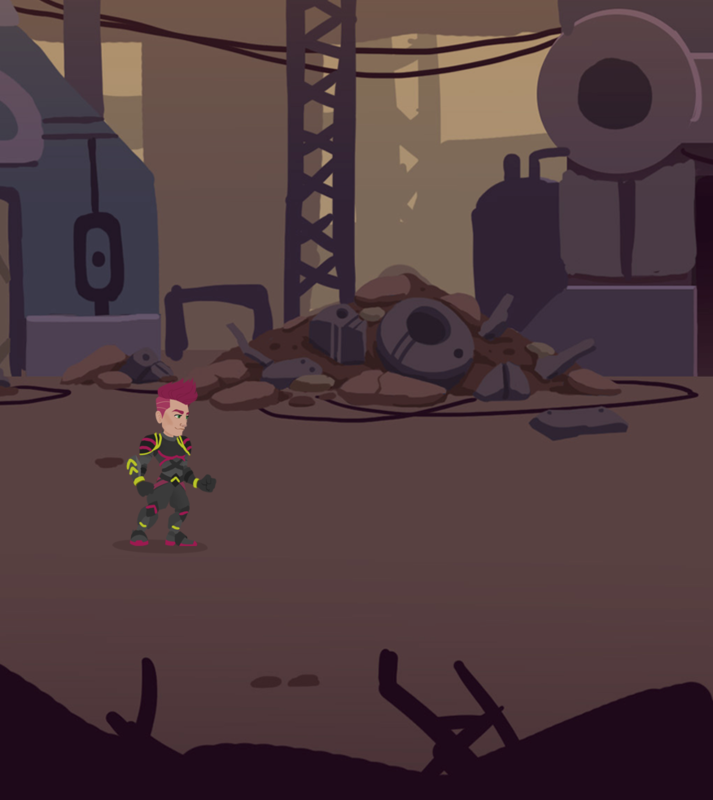 -The game world is mixed with both cyberpunk and natural elements. -Fighting plays a huge role in the culture of the inhabitants. -Characters are trained through the ways of ancient martial arts and adapt them to futuristic technology. 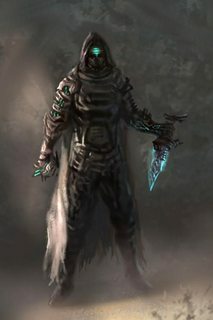 -Artifacts known as C Shards exist in the world, which are connected to the Code of the Universe and in the wrong hands can cause utter devastation. -Characters are animated through skeletons, and have a clean 2D visual style. Definitely dig the concept., and absolutely love the concept art. Also really like how you are handling encounters and leveling. My only question is how the battle system will ultimately play out - and the hack system. That sounds like a great idea - and hoping you'll have a decent variety of melee/ranged/status effects, because that sort of system can get pretty stale/repetitive if not handled well. 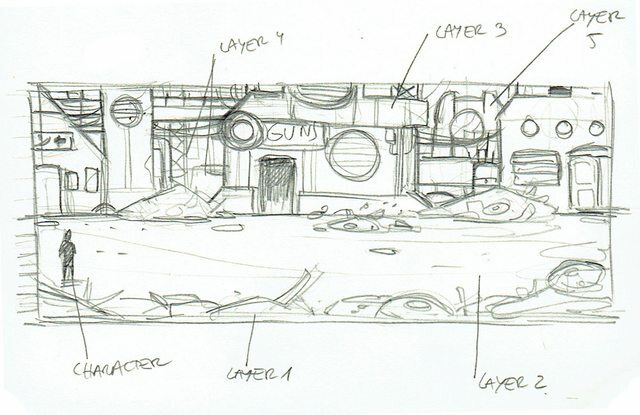 Update: We're fleshing out what the art will look like in the game. 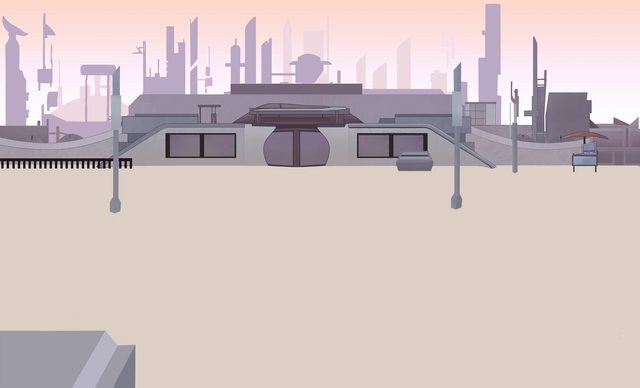 The following is a work-in-progress image of a background for a town level. We're also setting up the chapter tree in Unity. It's basically data on what enemy formations you'll be encountering in each area of each chapter. Most of it is blank for now. 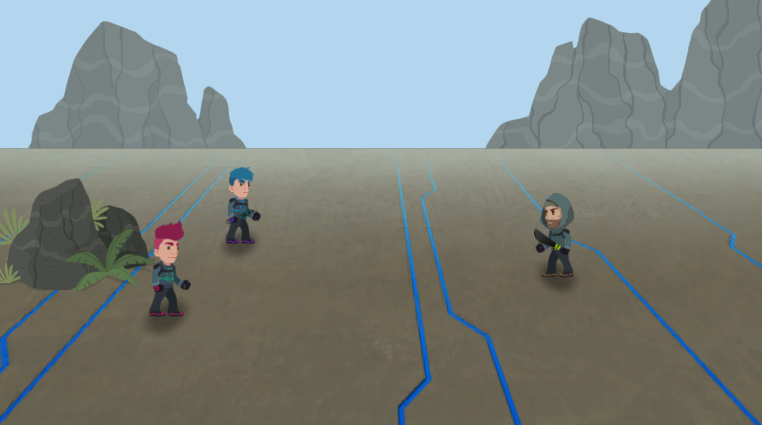 The battle system is making significant progress, but it isn't presentable quite yet. Once it's ready, we will provide a demonstration with a bunch of temporary rectangle people. Quick news: Prototype makes progress, art gets new modified direction. We made progress with the prototype: The battle engine is now complete and I've made some temporary graphics so you can see the visual feedback. Note: the animations are a bit clunky and ugly but they'll get a lot better when we start using Spine. We're currently looking for a 2D environment artist to join us. Profit share or freelance. EDIT: Hey guys! we found a fantastic artist to join our team! Thank you all very much for your submissions. How have you been everyone? We are getting a demo ready, but here is a gif of what we have so far. I lost a few nights working hard on this one, so you guys better like it!! I kid, I kid. All art in this gif is temporary. It's just something nice for you to look at right now. Also I think my screen capture was struggling to keep up and it made things look faster than normal. There's a lot more to this gif too. We have three other kinds of enemies, and one of them is able to speed up the battle system with his own hack gadget. The one that the party can use slows down time at critical moments, allowing you to focus and also learn new moves. There is a total of 9 enemy waves to get through. The UI is still a work in progress if that was not apparent enough, but you can interact both in the Planning and Action phases with either a keyboard, a mouse, a game controller or even a touchscreen (although multi-touch is not supported on desktops). And there's sound effects. Don't know how to play them here unless I make a YouTube video (although most of the sounds are from our previous game Earth Overclocked). Before we get the demo up, I'm going to make the UI look cleaner and add some game feel stuff to the game to make the game feel fun. Although I think it seems fun already. The demo is expected to be up tomorrow night as a Unity web game. We just need to tweak things here and there. 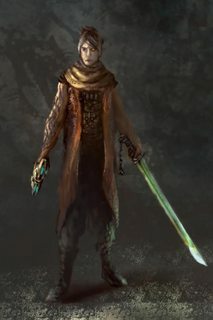 The demo is our minimum viable product for the game (https://en.wikipedia.org/wiki/Minimum_viable_product), containing the bare necessities that the game needs in order to be called a game. When the demo is up, I highly encourage playing it and providing feedback. In the demo you will play through Chapter 1 Area 1 with two party members and a decent set of moves, as well as the Slow Hack. Once done, please provide feedback in this devlog. Any feedback would be very valuable to us to help improve the game! And apologies for the ugly temporary MS Paint art. Vector art? Is it safe to assume this game has a serious tone? I hardly see vector art used in games with a serious tone. Might be because of the difficulty when it comes to having great detail in the work, but you guys seem to be pulling off quite a bit with it. Was Vector art the first choice, or did you just see it as the most viable? Actually it's high resolution hand-drawn PNGs. 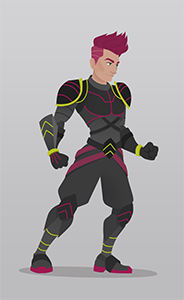 When we first set out making this game, we wanted to do vector art, but in the end felt that hand-drawn art would be the better fit for the game. Coded Universe will have a serious tone in terms of the overall plotline, but it will have a lot of humor within the dialog and some silly antics to keep things from getting "too" serious and give the game a nice charm. I apologize, but the demo will have to wait until Friday. We just noticed that while the mouse controls are fine and dandy, the keyboard and gamepad controls don't have any kind of visual clarity and are kind of confusing. We're going to spend a couple more days to add visual clarity to keyboard and gamepad controls. We'll also add a few other nice things like motion blurs and stuff. It covers the entire first level. The music and graphics are placeholders. All constructive feedback is very valuable to us. It is in terrible condition due to groups of Sparks patrolling the streets causing havoc over the years. The townsfolk don't know why the Sparks are there, but rumors say that they have been looking for an incredibly valuable object. Kleeg, Cyu, and Batch will be visiting this place every once in a while throughout the story. Not only have we made our first boss (doesn't have graphics yet), but we also made a robust dialog engine; all in one day! Progress is definitely picking up speed since the engine has been up and running. 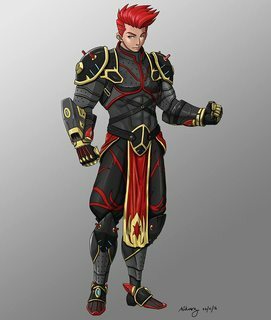 Hello, we just finished making the AI for the boss of Chapter 1, FORTRON! His unique set of attacks will test everything in your disposal at this point of the game. As usual, reminder that all graphics in the game at this point of development are purely placeholders. Currently the plan has been to level up the party after each major boss battle. I have realized, however, that having the game be all, "+2 HP! +1 EP! Everyone learns a new move! A new hack is now available! You have obtained a new item! Now go have fun with like your bazillion new things!" every time you beat a major boss would be a tad overwhelming for the player. I have been thinking of ways that other games have rewarded me. Plants vs Zombies gives you a small reward (usually a new plant) for every level that you clear. This gives the game an addicting nature, since you will want to try out your new plant, then when you get to try out the plant you will immediately have another cool plant to try out. The player will stay hooked and keep coming back to see what the next plant will be. I believe that the proper way to handle level ups being overwhelming is to spread out the upgrades as individual rewards for clearing an area in the game. The breadcrumb trail of rewards would also help to keep players coming back for more. 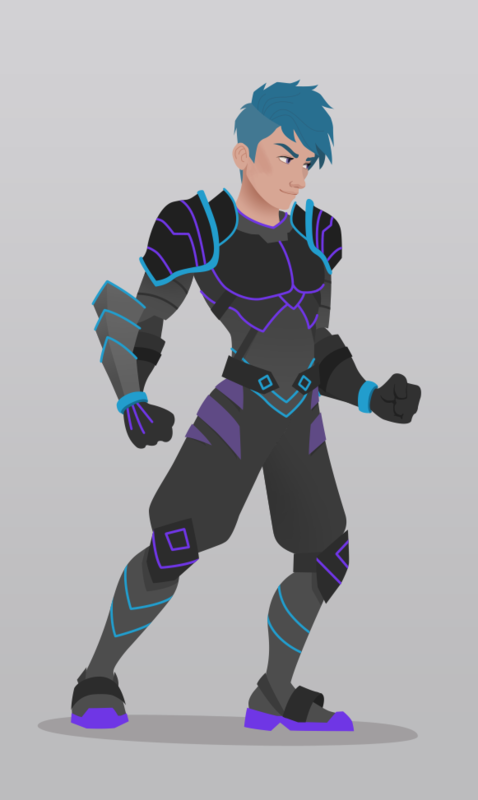 The team character artist Rik has finished the game art for Kleeg! Subject to change according to what our backgrounds will end up being like, but probably not by much. "This isn't even my final form" says Aaron as he programs away at speed and precision mere humans can only dream of. battle engine is undergoing a lot of updates, UI is a lot better, etc. Added Protowolf to the demo. Kleeg looks awesome, and I very much appreciate the Thousand Year Door inspirations. The Mario RPGs have been some of the best RPGs in recent memory. Regarding character upgrades: have you considered only making minor stat upgrades available via equipment you find gradually? This way you can have solid control over character growth while not flooding the player with info all at once. Though it's admittedly a bit less rewarding than a level system. Really though, a small flood of stats isn't that overwhelming. A single dialog can contain things like "HP, Atk, Def up." I think some of the Marios had a little roulette system where you could even influence how much some stats went up. Regarding hacks: Tell us mooorrreeeee. I imagine a Fluxx like system where you're constantly changing the rules of the game, though I imagine yours isn't quite as chaotic. Character Upgrades: The current plan now is to span out the upgrades more so that you get a small piece after every area. Chapter bosses will still give the primary stat boosters, but you can find cool equipment and such from clearing areas in the game. For example, one item you get early in Chapter 2 transforms your "Do Nothing" action into "Recharge," which regains a minor amount of EP (Energy Points, the mana of this game) back on use. Hacks: I can say more more about hacks. Basically, hacks are abilities that you can activate during the "move select" phase of battle. They do not count as moves, so a unit does not need to sacrifice his turn to use a hack. Each hack has a turn cooldown after use. The current available prototype includes the Slow Hack, which slows down time during critical moments for the rest of the turn. This makes it extremely easy to perform action commands and defend against incoming attacks, and it also makes you feel like you're in the Matrix. The Slow Hack has a 3 turn cooldown, though, so use it wisely. There is also a late game hack that will make all of your attacks pierce enemy defense for the duration of the turn. You're not the only one who can hack. Each chapter has at least one enemy that can also perform hacks. In fact I just finished programming an enemy hack called Distortion Hack, which randomizes the attack and defense of all enemies for the remainder of the turn. It also has a 1 turn cooldown, so the hacker can constantly spam Distortion Hack every turn. You have to pay attention to the changing enemy stats and choose wisely who to attack, or kill off the hacker to make enemy stats stable again. Rik is working on making the "playable character" graphics. I feel like that I need a plushie of Cyu now.